As an Irishman, it’s rare to find a fresh take on emigration. The culture of leave-taking and return, post-Christmas news reports from the departure gates at Dublin Airport, regularly thinking eight hours ahead, finding yourself in an Irish bar at 6 a.m. watching a sports game “from home” – most of these are familiar to the Irish emigrant. Along with the songs and stories of course – from John Healy’s “The Grass Arena”, to Ronnie Drew’s recording of “McAlpine’s Fusiliers“, to the granddaddy of them all, James Joyce’s “Ulysses’, written in three continental cities but a chronicle of only one. Historically the message has usually, ultimately, been one of exile – whether by force or choice. This ‘push’ story has often obscured the ‘pull’ narrative, the story of the return to Ireland: there are not as many songs about the prodigal Irishmen and women who came back. This “pull” is the subject of a short, early poem of Seamus Heaney’s. “Gravities” appeared in Heaney’s first collection, “Death of a Naturalist”. It’s a poem that examines the “strict and invisible” force that pulls people back, to relationships and to countries. Though reined by strings, strict and invisible. Is heading home, instinctively faithful. Re-enter the native port of their embrace. by wearing Irish mould next to his feet. 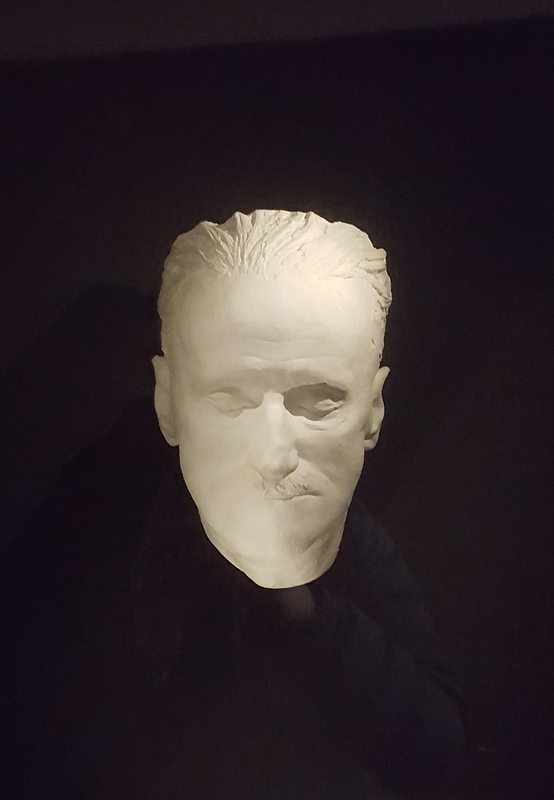 In a black box, glass-faced, placed in a room on the top floor of a Georgian house. Or the pain of the eye operations. It’s not the original death mask – instead the product of revisions and iterations. But it’s his parting glance to the world. James Joyce sleeps in a quiet room, four storeys up, between Eccles Street and Nighttown. Oddly, he looks at home. Had whipped their way over South Carolina. A clean slate for Autumn. And this driftwood beach and empty tourist town was ‘it’, the moment we reached the other coast. In 24 hours we would move on. For now, all was clear and endless. We ate by a beach campfire, and slept heavily that night, unburdened. Grey and wet and cabin feverish – in my memory all the rainy afternoons of my childhood holidays merge into one. Waking on a wet Saturday morning, usually at a grandmother’s house, we would wait and hope, through breakfast and the drizzly morning, over lunch and on into the afternoon, that the rain would stop. By 3pm, after hours of books and board games, and more than a bit dispirited, we would be dragged from the fireplace and out for a spin in my dad’s car. If we were lucky, the deluge or drizzle would stop. But often it did not, and so another July weekend would be lost to the vagaries of the Irish weather. The advent of the internet, and a longer concentration span, and my sheer bloody mindedness nowadays when it comes to getting outside and getting soaked, means that a rainy Saturday isn’t the complete write-off it once was. After moving from one rainy city (Dublin – 29 inches per annum) to another (Portland, Oregon – 36 inches), I’ve finally got used to rain. It’s only taken 40 years. Just as well, as my wife and I woke to hail, rain, thunder, lightning, and 55mph gusting winds last Saturday. We were visiting our friends’ beach house in Manzanita, Oregon, a very fine property located all of 200 meters from the (very loud and very windswept) Pacific Ocean. We were away from home. There were no chores to be done, no emails to be checked, or calls placed. My phone was turned off. For the first time in years, I experienced a rainy Saturday on vacation. What did we do? Well, the same thing I did with my family 30 years ago. We had breakfast, chatted, ate some more, read a bit, watched the fireplace, and read a little more. And ate a bit more. And then we bundled into the car and headed out to the village for a damp stroll. Plus ça change, as the French say. And pass the sauvignon blanc. The only difference between a rain-soaked Saturday in 2018 and one in 1988 as the occasional adult refreshment, which eased us into the afternoon and, truth be told, into the early evening as well. How wonderful it was, to sit and sip and chat and attempt another two pages of the ‘Nighttown’ chapter, and then nibble and sip and chat some more. On occasion, I’d even forget the raging tumult flinging torrents of water on the windows. Until the next thunderclap. Could I do it every weekend? The 10-year-old me from 1988 would probably give you a short, sharp answer to that – which I’d agree with today. But once in a soggy blue moon? Let it rain.